Currently, there are approximately 2 million foreigners living in Japan. It is not uncommon to hear different languages on buses and subways. Even if you don’t understand what they are talking about, you can sort of guess if they are enjoying themselves or having problems. If they look like they are in trouble, you probably want to help them. Actually, they feel the same way. Wanting to help people who are in trouble. Being really happy to see them happy... If people who feel like that get together here in Kyoto, big energy can be created. It may involve you become a source of motivation. There are differences of language, customs and concept of values. We think they can be a source of societal energy if people can understand them. There are many different people. That is why we can live comfortably. Why don’t we establish a society where everybody feels comfortable? Supporting foreign students who are the future leaders of local society! In Kyoto, a city filled with universities and colleges, there are approximately 10,000 foreign students. For them to feel secure and comfortable living in Kyoto, a subsidy to the National Health Insurance and courtesy projects for foreign students are available. 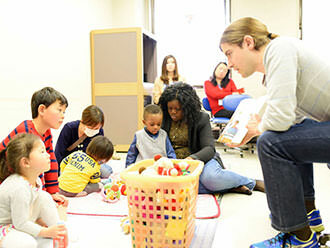 Foreign students have different cultural backgrounds and they are the bridges between Kyoto and their countries. There are opportunities for them to introduce their own cultures at elementary and junior high schools. I want to express my opinions and thoughts! To better understand foreign nationals living in Japan, it is necessary for them not only to learn Japanese but also understand the social conventions of Japan. 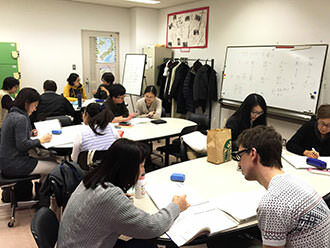 We provide support for them to study Japanese in small groups and orientation programs so they can become familiar with everyday life by getting rid of the language barrier and actively participating in community activities. Increase the number of leaders who promote local international understanding! Getting involved in volunteer activities creates opportunities to think about the further international involvement of Kyoto and multicultural society, which support creating a community where anybody can live in comfort. We are trying to build an energetic Kyoto where every single volunteer can actively promote international involvement in their communities. Year by year, the financial condition has become more severe due to decreased project budgets and designated cost controls from Kyoto City. As a result, we are working hard to secure funds through various measures such as using grants and obtaining co-sponsorship with corporations as well as accepting donations. Donations are carefully used to support foreign national residents and students in Kyoto together with promoting a multicultural society. If you would like to make a donation by some method other than credit card, please call our General Affairs Section (075-752-3010).